The BetaGauge 301 is also available in a kit that includes the calibrator base package with a hard case, tubing, fitting and a pneumatic pressure calibration pump. Based on the pressure range the calibration pump is either the MECP100 or MECP500. 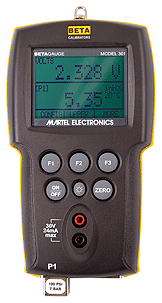 The Martel BPPA-100 BETA Port Pressure Adapter allows Martel Betaport-P pressure calibrator modules to be connected to most Martel pressure and multi function calibrators.